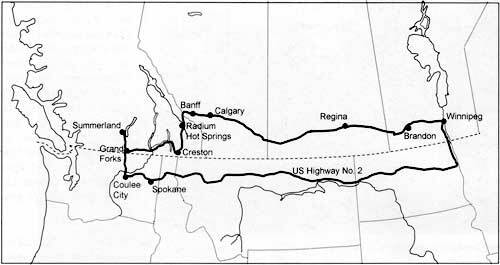 At the beginning of July, 1925, the Armstrong family and two other couples set out from Winnipeg to visit Mrs. Armstrong’s sister who lived in Summerland, British Columbia. Dr. James W. Armstrong, had retired both from his busy medical practice in Gladstone, Manitoba and from a career as a provincial politician. He had purchased his first car in about 1908 and visited patients throughout the Gladstone district, and with trips to and from Winnipeg, Armstrong was an experienced motorist. By the time the family took this trip, cars were no longer a novelty but, as we shall see, the Western Canadian road system was not well developed. 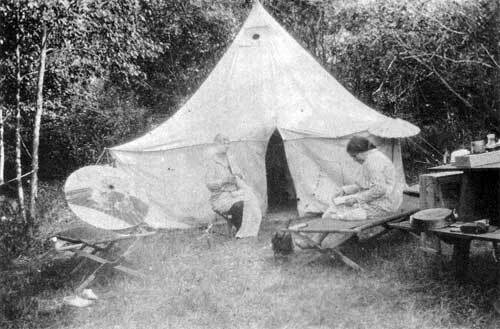 Their two daughters, Flora and Ida, in their early twenties, accompanied their parents on the trip. Flora kept a daily diary of events. Along with candid descriptions of the countryside, it presents horrifying pictures of road conditions and describes the agony of keeping the car running, particularly the constant changing of flat tires. The first day of the trip, from Winnipeg to Brandon, went well. The daughters rode with their brother, Pearce, in his Model A Ford. He went along to Brandon to see them off. July 2. Left Wpg. At 2 o’clock, Ida & I in Pearce’s car. Stopped at Poplar P[oin]t.
Saw Mrs. MacLean & Fidlers. Steep hills. Arrived Brandon at 9 o’clock & put up tent in rain. 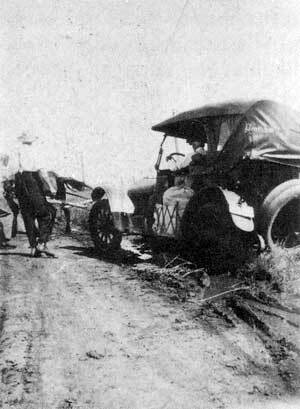 The other two parties, Mr. and Mrs. Strachan, and Mr. and Mrs. Hill, arrived in Brandon during the next day. After taking in the Brandon Fair, the three car convoy moved on to Oak Lake after supper. Good progress was made the following day, and the group decided to spend Sunday in the Qu’Appelle Valley. After a bit of sight-seeing, a chilly dip, and an evening camp fire, the party slept well. Pulled out at 10 this morning & drove down the lakes & out of the valley. Ledge drive. Got to Regina a 3 O’clock. Good camp but no trees. Went down town to do some shopping and left for Moose Jaw after tea. Lost Mr. Hill because we left him behind & had to wait. Heavy rain that night so we stayed in Moose Jaw all day. Up at 5 o’clock on Wednesday morning ready to start at 7. Trouble with Father’s oil pump & we didn’t get away until 10:30. Showery—got caught in several—bad grades. [After lunch] The sun was shining but we ran into a storm & had to stop beside a hill. Hail and very slippery roads. Got ditched, then struck gravel & had a good road to Herbert. Only 32 miles to Swift Current & it is sand. Roads were good. Rotten roads. Arrived 11 & had supper. 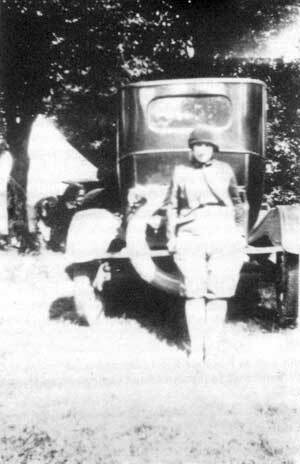 Flora Armstrong with their Model A Ford near Brandon, July 1925. Thursday—a flat tire on Father’s car. Up at 6. Roads bad. Hoped to get to Med[icine] Hat. Everybody sick. Mr. Hill & Mother the worst. Very hot day. Lonely looking country. Miles without trees. Little hills. Stayed at Hatton. No camping ground & lots of flies. Friday—Had to grease car. Oil [camping] stoves wouldn’t work—2 hrs. spent on them—Left at 10 o’clock & reached Medicine Hat at 12:15. Broke the gas pipe on Father’s car. Very hot—Had lunch & made sandwiches. Mr. & Mrs. Hill went over town & didn’t return till 4 o’clock. Late start. Not a tree & hardly a house for about 75 miles out of Medicine Hat. Perfectly flat. At times couldn’t see a thing but prairie. Roads fine in places but a great deal of rough road. Barren. Stopped at a town to change tires. Stopped at Brooks, Alta. Armstrong family car trip route. Saturday—An early start. Very hot day. Fairly good roads—40 miles an hour. Then rough roads. Country looking more prosperous. Lots of new farms with new bungalows. Good crops. Stopped at Gleichen to wait for Mr. H. Mr. S. left too soon & went ahead. Reached Calgary at 10 o’clock. Others arrived at 2. Trouble with Father’s car. Put up tents & went for a swim. A crowded camping ground on account of Stampede. We have a nice situation right on the point. The Bow river has a very strong current but water is very clear. Poor accommodation for such a city. Did our washing in the Bow River before supper. Everybody dressed up & went to Stampede at night. Saw mounties with their horses that drill. Saw the train of 26 black horses, longest in the world, drawing over a million bushels of wheat. Down town afterwards for food. Dead tired. Sunday, July 12, was spent relaxing, sight-seeing in Calgary and attending a church service in the evening. On Monday morning they packed up again and headed for Banff. For a prairie dweller, the approach to the mountains is described as a “wonderful sensation” although the road was narrow. The next three days were spent in Banff, and included a climb up Sulphur Mountain, a swim in the hot springs, visits to the museum and zoo, a boat ride and picnic on Lake Minnewanka, and some shopping for souvenirs. On Friday they had an excursion to Lake Louise, where they went horseback riding around the lake. They had also planned to visit Morraine Lake, but the air was too smoky. There was a rumour that there was a forest fire at Windermere, B.C. which might hold them up. Saturday—Father played golf & Mr. S. & [Mr.] H. went to see about [the] fire. Decided to stay, then decided to move. Pressed & cleaned & mended, then packed up. Stopped at Johnson Canyon & went through it. Road leads along river. High walls above. Many bridges. At last we passed through a cave & were right at the falls. Very steep. Water looked like snow coming over—great vapour and we got quite wet. Stopped at Marble Canyon. Road is along top and you can look down 200 ft. & see water. In places the walls almost meet. In one place there is a natural bridge across. Took snaps & got several pieces of marble. Had lunch & went on—a dangerous road—many turns. Mr. S. had a flat tire. 15 miles at night, right over a mountain. Stopped by a Mountie & shown camping ground—just a mile from Sinclair Springs. 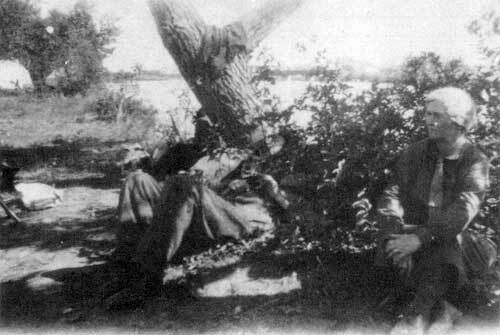 The Armstrong family at a rest stop near Calgary, July 1925. Again, Sunday, July 19, was a day of rest, and time for some letter writing. In the evening they went for a dip in Radium Hot Springs. Monday—Got on our way at 10 o’clock. Passed through Sinclair’s Canyon, very wonderful. Stopped often to look. Managed to reach Cranbrook at night. Roads very, very dusty. Many stops. Car not working too well. We got supper. Met the young people we had last seen at Calgary and went down town. Wrote to Pearce & Jean H. Night not so cold. Tuesday—Up at 5. Had cold shower & froze, very cold. Packed up and left by 7:30. First car out. Roads very narrow. Passed through a great deal of burnt out country then through a jungle. Much dry wood, all mixed up. Many fire precautions. Roads were very narrow, passing impossible. Car difficult to start when hot. Had a flat tire. Met 3 cars on precipitous road. Road very rocky (steepest and narrowest yet) rough riding. Made Creston at 12:30. A bank there but passed on to Kuskinook, 18 miles further on. Arrived at 2 o’clock & had to wait until 5. Hung around, ate, & dug for my bathing suit. After finding it, found that there was not time to swim but then found out there was, so Ida & I went in at the pier. Very good. Got dressed & ready for boat. It took a long time to pack cars in. Man told us we had to put top down but we told him it wouldn’t go down, so we got on last. Best position. Went on deck, then walked around boat. Felt funny when in stuffy sitting room. Had dinner. $1.25 per. We ate that much. Mountains on both sides & the water was as clear as glass. Saw C.G.I.T. Camp & saw boat land several times. Saw different lights on buoys in water. Intermittent light. Each light a different intermission. Landed at Nelson, along with bride & groom. Got settled early. Wednesday—Planned to get to a garage to see what was trouble with car but others in a hurry so didn’t. Car difficult to start, so went on 48 miles to Trail. While passing man with wagon of hay, we caught the back part of top on rocks. Gave it such a wrench that it pulled front windshield & side glass & broke front part of top and bent back part & tore cover. Mended it & then car wouldn’t budge. Now about 11:15. Worked till 2, then ate & worked again. After a couple of hrs. got started. Ground wire off. Went across ferry, then rain started. No damage to roads. Got to Trail O.K. A terrible hill between Trail & Rossland. Car missing terribly. Came all the way in low but just at top of last hill it stopped & went rapidly backwards. Stopped just at sidewalk. No damage done. Fixed cylinder but no difference. Great deal of trouble with car missing. More steep hills, then we sped down hill 5 miles to Steep Creek. A forestry station at top of hill. A very plain camp, ground rocky, just 2 miles from border. Thursday—Father up at 4:30 to change a tire. Got packed & away by 8:45. Just 2 hills between there & Cascade but 1st was 8 miles up & 8 miles down. Had to stop to cool engine after going up. Car running fine but a terrible clang when in intermediate gear. Stopped to oil it but no better. Roads wide but steep. Stopped for lunch & did more greasing. It rained much but roads were very good up to Grand Forks. Car fine in high gear, no hills. Just pouring at Grand Forks. We stopped for gas. Fine roads. Climbed making an awful noise but all right in high gear. Going fine until we climbed a hill & changed gears. Noise getting worse & worse until the thing broke & the car stopped. Clutch cone smashed. Mr. H. went ahead for Mr. S. and we towed car back to Grand Forks. Found we could get a piece there & so we set up camp. Our turn to make dinner. Rained just when we were starting a good dinner. Friday—Up earlier than necessary. Breakfast. Father & I went down town & found car all fixed but glass in windshield. [Wrote a letter] & went back & finished packing. Clutch grabbing much. Car stopped 2 miles west of Okanagan Falls so we camped on the roadside. Saturday—Found that sleeping on the side of a mountain is no good. Slipped out of bed feet first. Arrived Penticton at 11. Stayed for awhile. Went S. [to Summerland] at 1 o’clock. Here, on July 25th, the diary pauses and when it picks up eleven days later, on Wednesday, August 5”, preparations are being made for the family’s departure from Summerland. Thursday—[After some good-byes] Made good time. Passed border at noon & camped at Mansfield [Washington State]. A good place for lunch. A great deal of climbing up late in the afternoon. Car didn’t climb well. Suddenly came to flat roads on top of the hills. Hilly roads. Friday—Riding in Mr. Strachan’s car. Very dusty. Passed through a deserted country. Nothing seems to grow except sage brush. Could hardly find a place for lunch. Such dust. Father ran out of gas. Got it from a man driving a gas truck. Many miles newly gravelled road. Fast driving. Met dozens of cars. Had stopped for an hour at Coullee City. Made time on gravel. More deserted country. Had lunch by roadside then went on to Davenport. Father stopped for gas & couldn’t get going again. Studebaker man came along. Father went away & then car started but ran roughly. Ran all the way to Spokane like that. Left Davenport at 4:30 & after spending over 2 hrs. there. Reached Spokane at 6. Had to go down a steep hill to the camp. 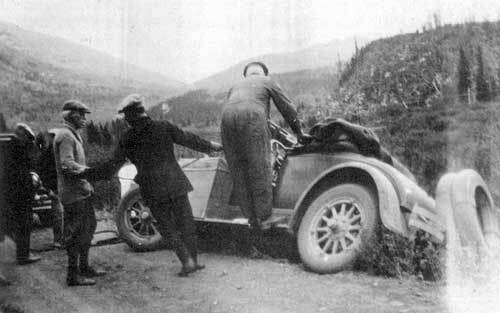 Flora always said that the car was repaired in Spokane, and ran better than it ever had, all the way back to Winnipeg. Nevertheless, Dr. Armstrong was so annoyed with the troubles it had caused that he sold it as soon as they reached home.